Graph 2 shows the total reported suspected, probable, and confirmed cases and deaths in Guinea provided in WHO situation reports beginning on March 25, 2014 through the most recent situation report on February 3, 2016. Graph 2 shows the total reported suspected, probable, and confirmed cases and deaths in Guinea provided in WHO situation reports beginning on March 25, 2014 through the most recent situation report on January 20, 2016. Graph 2 shows the total reported suspected, probable, and confirmed cases and deaths in Guinea provided in WHO situation reports beginning on March 25, 2014 through the most recent situation report on January 6, 2016. Graph 2 shows the total reported suspected, probable, and confirmed cases and deaths in Guinea provided in WHO situation reports beginning on March 25, 2014 through the most recent situation report on January 13, 2016. Graph 2 shows the total reported suspected, probable, and confirmed cases and deaths in Guinea provided in WHO situation reports beginning on March 25, 2014 through the most recent situation report on December 9, 2015. 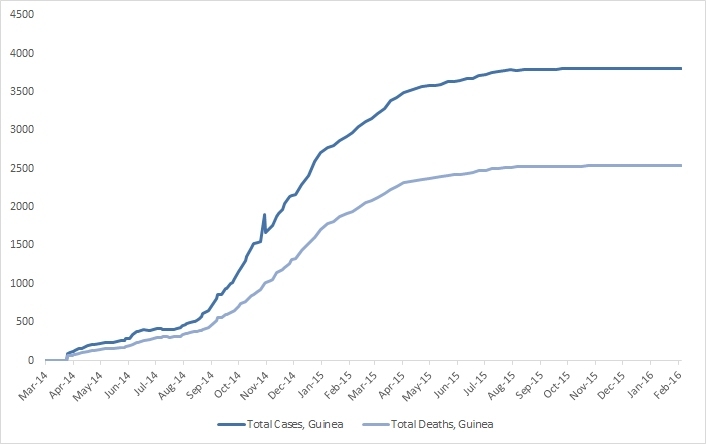 Graph 2 shows the total reported suspected, probable, and confirmed cases and deaths in Guinea provided in WHO situation reports beginning on March 25, 2014 through the most recent situation report on November 25, 2015.